ML Skin Spa now offers breakthrough KYBELLA injections that permanently destroy the fat cells beneath your chin so they can no longer store or accumulate fat. There are three main causes: weight gain, genetics and aging. You definitely don’t have to be overweight to have fullness under your chin. Unfortunately, sometimes, no matter how much you exercise or diet, your double chin may not go away, causing you to look heavier and older than you actually are. What is KYBELLA and how does it destroy the submental fat? KYBELLA is an FDA-approved prescription medicine used in adults to improve the appearance and profile of moderate to severe under-chin fat. 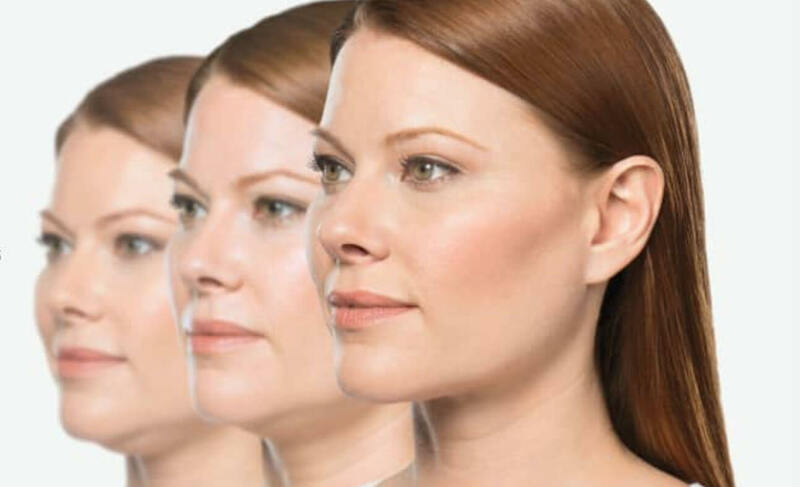 Now, you can get rid of your double chin noninvasively without surgical liposuction. The active ingredient in KYBELLA is synthetic deoxycholic acid, a naturally occurring molecule in the body that aids in the breakdown and absorption of dietary fat. When KYBELLA is injected into the submental fat, it permanently destroys the fat cells, which are then removed through the body’s lymphatic system. Once destroyed, those cells can no longer store or accumulate fat. Both men and women over the age of 18 with a double chin are candidates for KYBELLA. You’re bothered by fat excess fat under your chin. You eat well and exercise, but it doesn’t affect your double chin. You should not receive KYBELLA if you have an infection in the treatment area, or if you are pregnant or breastfeeding. KYBELLA is a quick in-office treatment. After we apply topical anesthetic to the treatment area for about 20 minutes, we precisely mark the area based on the amount of submental fat. Then, we inject the KYBELLA solution. During your consultation, we’ll discuss your expectations and determine how many treatments are appropriate for you. In general, most clients need about 2-4 treatments. You can schedule your second KYBELLA treatment one month from the initial treatment. However, we recommend waiting two months between additional KYBELLA treatments to see the full results. The gradual tightening effect takes place over a period of at least six weeks. What is the downtime after a KYBELLA treatment? You’ll be able to resume your normal daily activities immediately. but will have some swelling for 3-5 days afterwards depending on how many vials are injected into the treatment area. Most clients need 2 vials during the initial visit. Applying ice packs to the area for couple days after the KYBELLA injections will help minimize swelling, as will frequently applying the complimentary arnica ointment we send home with you. KYBELLA is FDA approved for the treatment of submental fat and is very safe when injected properly in the right candidate. The most common side effects of KYBELLA include swelling, bruising and discomfort after the treatment. Very rarely, temporary numbness and hardness may occur. When will I see results from KYBELLA? Your results will become visible over the first 2 to 3 months. 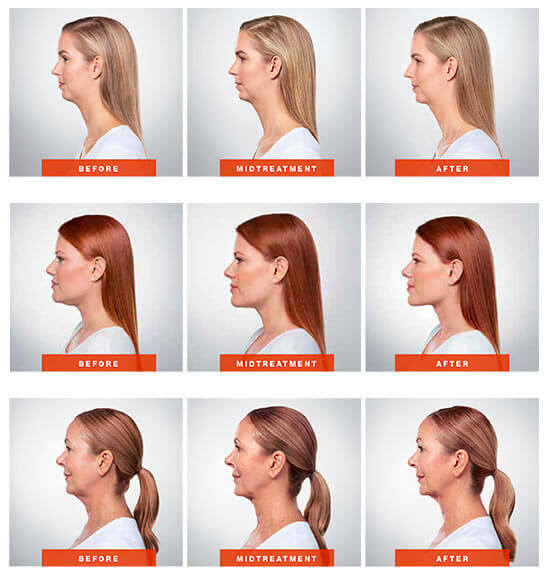 After a full series of treatments, most people notice a more sculpted under-chin area. The results may continue to improve over the next six months following the treatment series. In clinical trials, KYBELLA has shown to have skin-tightening effects as well. On RealSelf, 95% of Kybella clients say the were happy with their results. Do I need a follow a strict diet and exercise program after KYBELLA injections? Although a healthy diet and regular exercise are always recommended, the results from the KYBELLA treatment are permanent and are not effected by diet and exericse. What happens if I gain weight at some point after the KYBELLA treatment? Even if you do gain weight, it may not affect your under-chin area. You can always get a touchup treatment if necessary. What Does KYBELLA treatment cost? The cost of the treatment is based on how many KYBELLA vials are required to achieve your desired results—although any amount of treatment will make a positive, long-lasting improvement. We’ll discuss in detail your expectations and costs during your initial consultation. What are the advantages of the KYBELLA treatment over other double-chin procedures?